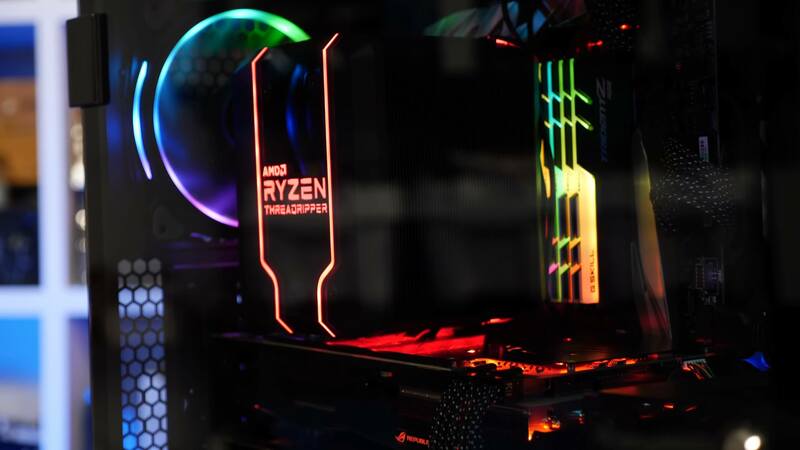 Yesterday we took a long look at the new Threadripper 2990WX and 2950X processors. In short, the 2950X impressed with solid performance across the board at a premium yet competitive price. The 2990WX was less impressive with mixed performance and a high asking price. Right now Windows 10 is being blamed for the mixed results and perhaps rightfully so, we’ll have to look into this further and keep our fingers crossed for an update. In the meantime, a large number of people voiced concerns over our testing, and many others, as we were only testing a single application at a time. We had always planned to make a separate multi-tasking focused benchmark and we said as much in yesterday’s review. While editing and wrapping up the 2990WX and 2950X review we began looking into multitasking performance and after additional days of testing, we’ve got a few more results to discuss. 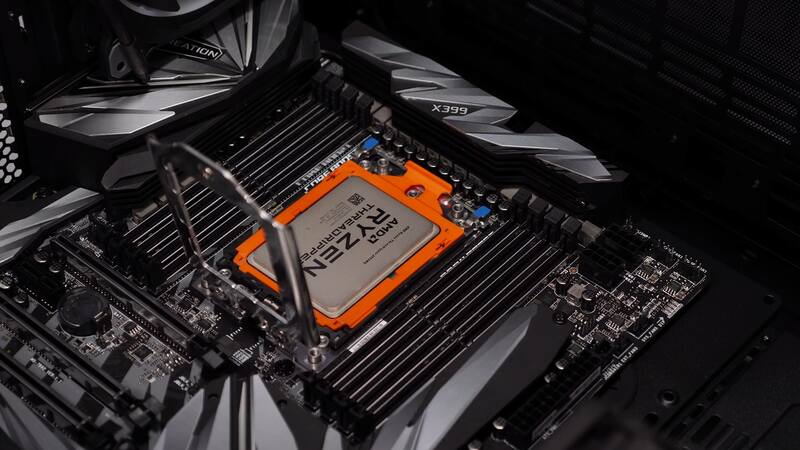 For this test, the 2990WX has been compared directly to the Core i9-7980XE and we have 5 batches of multi-tasking benchmark results to check out. All the testing was conducted using stock out of the box settings with a 240mm closed loop cooler install on each CPU. There was some jumping up and down about the Wraith Ripper causing the 2990WX to throttle in our benchmarks despite us showing footage that contradicts this. Anyway, it wasn’t throttling and we did test both air and liquid while making the original content and found no difference with stock settings. Moving on, both systems have been configured with 64GB of DDR4 memory using eight 8GB modules and this limited the 2990WX to DDR4-3000, while the 7980XE could go much higher but we settled with low latency DDR4-3200 memory to try and keep things even, and somewhat realistic. The following graphs might look a little odd at first, especially when compared to what you’re normally used to see, but we’re hoping the format will be easy to follow as it gives you all the info on a single graph per test. 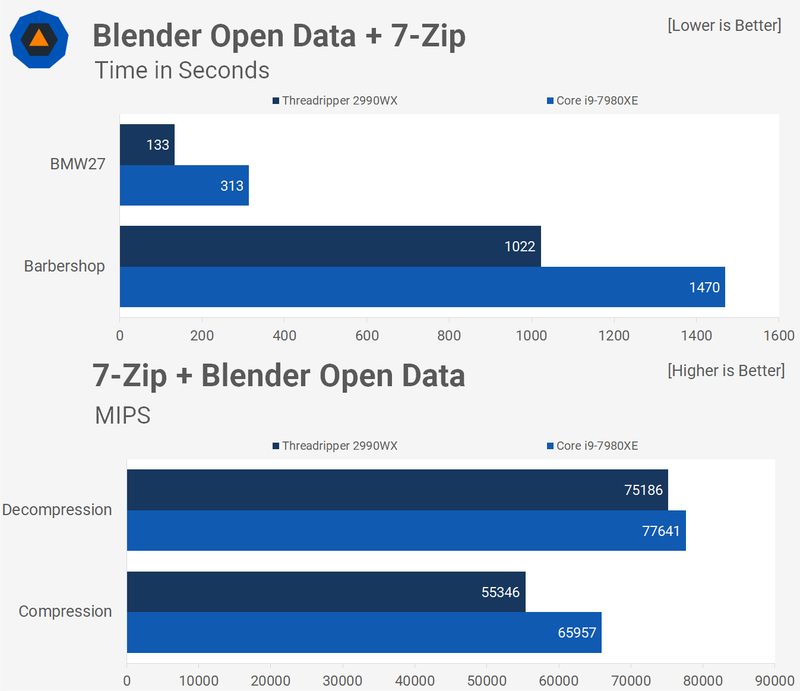 First up we’re going to look at how the 2990WX and 7980XE compare when running Blender Open Data and 7-zip. 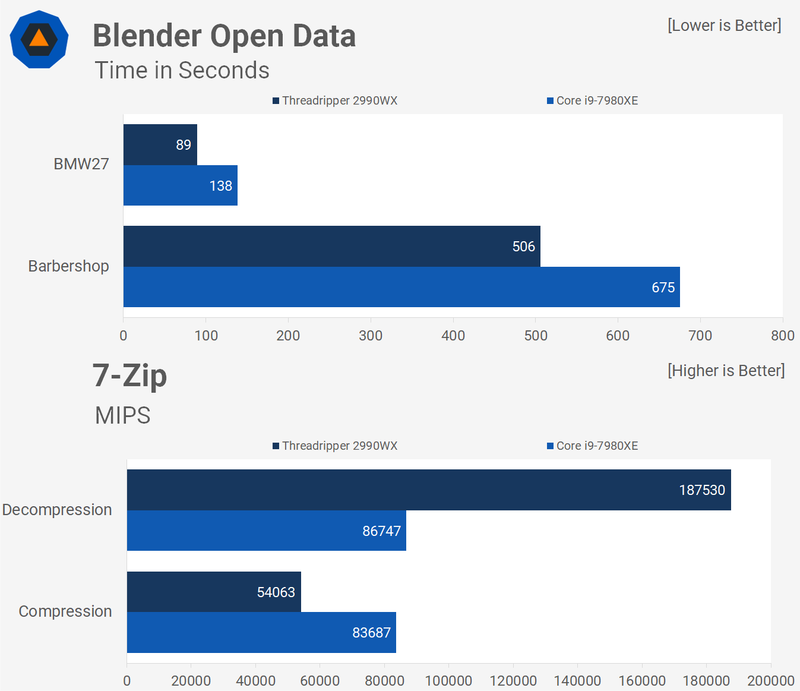 Note that results here show how the CPUs perform in each application individually, so that is to say Blender was executed and completed before moving on to testing 7-Zip, so these are just standard benchmark results. Here the 2990WX completed the BMW27 workload 36% faster and the Barbershop workload 25% faster. Then with 7-Zip, we see the 2990WX is 116% faster for decompression work but 35% slower for compression work. Now let’s run both the Blender and 7-Zip applications simultaneously, 7-Zip is on a continuous loop while Blender runs its standard batch of workloads. Here we see a few interesting things. The 2990WX is now 58% faster for the BMW27 workload and 30% faster for the Barbershop workload. However, the 7-Zip performance is less favorable. Whereas the 2990WX was 116% faster previously when looking at the decompression performance, it’s now 3% slower. In the compression test, it was 35% slower previously and now it’s only 16% slower. Basically, the 2990WX was already mighty impressive in the Blender rendering test and adding 7-Zip to the mix just makes it look more impressive, but the massive advantage it had in 7-Zip is now gone, making it inferior in both the compression and decompression tests. The 7980XE certainly appears to be prioritizing 7-Zip while the 2990WX is prioritizing Blender. Next up we’re testing with HandBrake and RealBench. 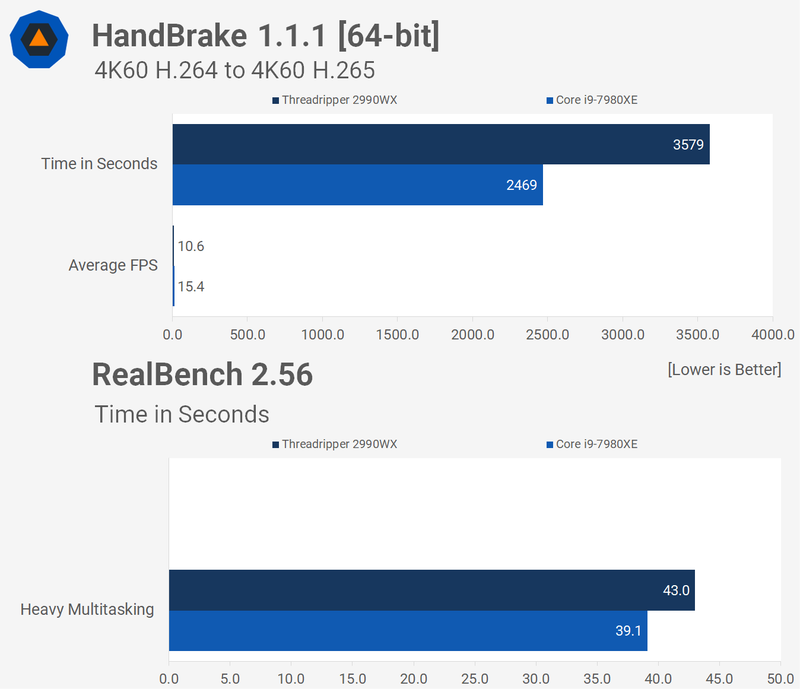 For HandBrake, we have an H.264 4K 60fps video that we’re converting to H.265 4K 60 fps and we’re reporting the average frame rate, as well as the total, render time. Then RealBench will be running its heavy multitasking workload on a loop. The 2990WX doesn’t do well in HandBrake and here it was 31% slower than the 7980XE. It’s also not great in RealBench either, taking 10% longer to complete a single pass. Let’s now combine these two tests by running them simultaneously. With both applications running simultaneously the 2990WX is now 17% slower than the 7980XE in HandBrake which is a reasonable improvement, but of course, still slower. 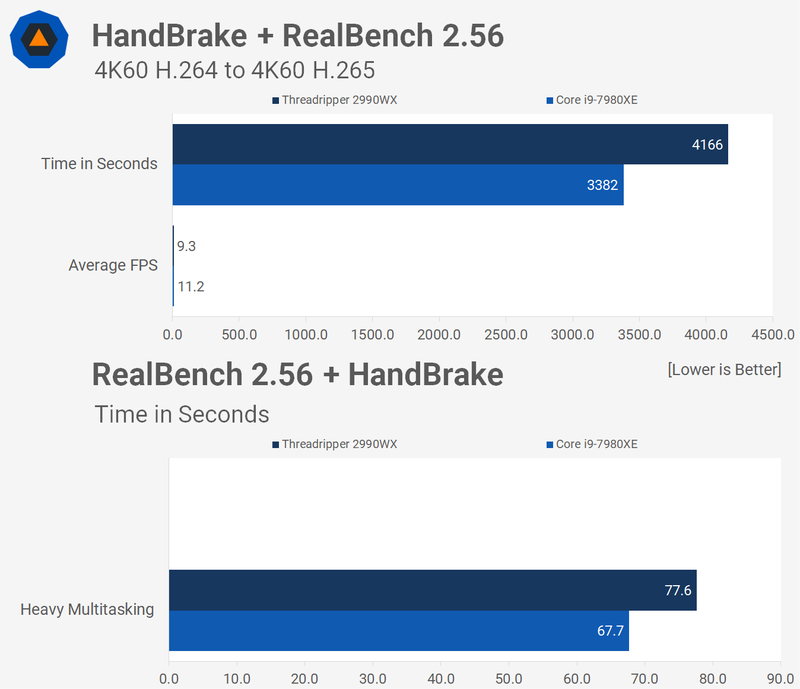 However while we saw a reduced margin in HandBrake we see the margin increase a little for RealBench, the 2990WX is now 15% slower. So the 2990WX wasn’t really able to make up any ground on the 7980XE in this multitasking benchmark. One of the worst results for the 2990XW seen in our day one coverage was found when testing with VeraCrypt, 1GB test. So we’re combining that test with one of the best test results for the 32-core processor, which was seen in Corona. Here the 2990WX was 28% faster than the 7980XE and as we’ve seen it always does well in rendering workloads. 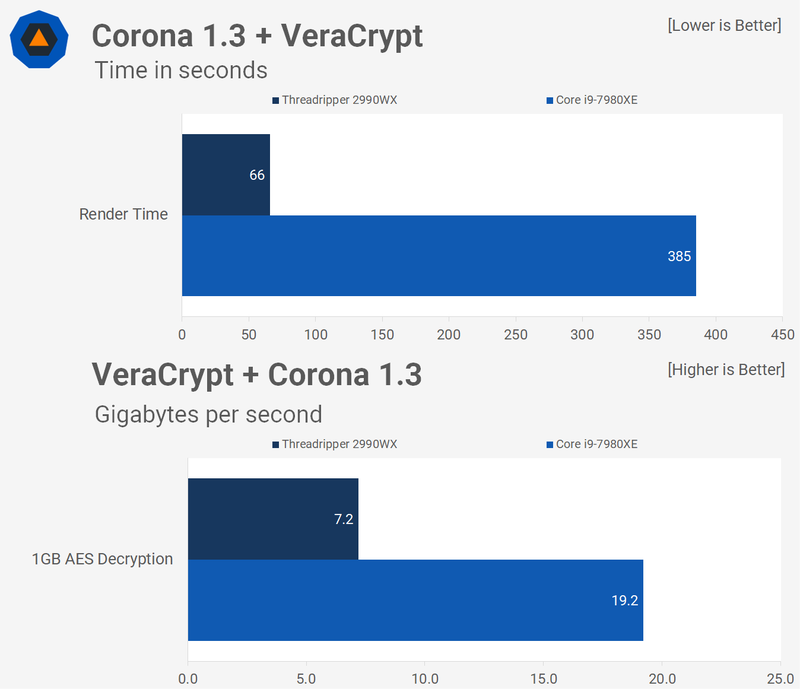 However, for VeraCrypt it was 47% slower, not a great result that one. So let’s now run these applications simultaneously. 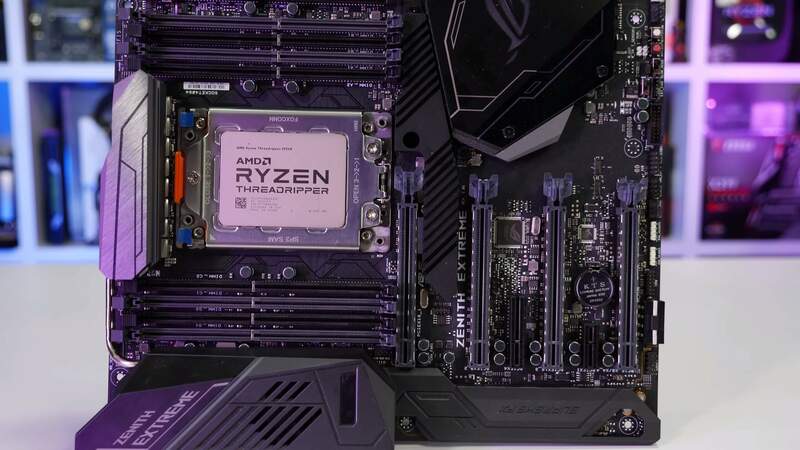 As we saw in the first series of multitasking benchmarks AMD seems to prioritize rendering workloads while Intel favors the memory sensitive workloads. The 7980XE took almost 6x longer than the 2990WX to complete the Corona benchmark while it only saw a 7% reduction in decryption performance. Meanwhile, the 2990WX saw a 34% reduction in decryption performance and a 61% increase in rendering time. So the 32-core processor does appear more balanced here and so it should with 14 more cores. 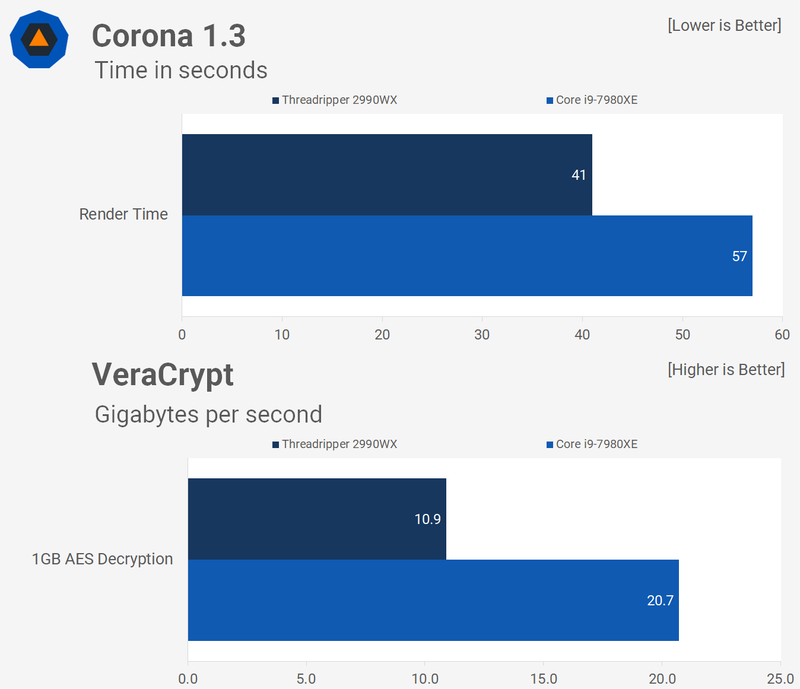 Still, we do have mixed results for the 2990WX, it’s amazing in Corona and horrible in VeraCrypt and that’s true whether you run these applications individually or simultaneously. This time we have three applications: HandBrake, CPUz, and 7-Zip. Here’s how they all perform individually on each CPU. 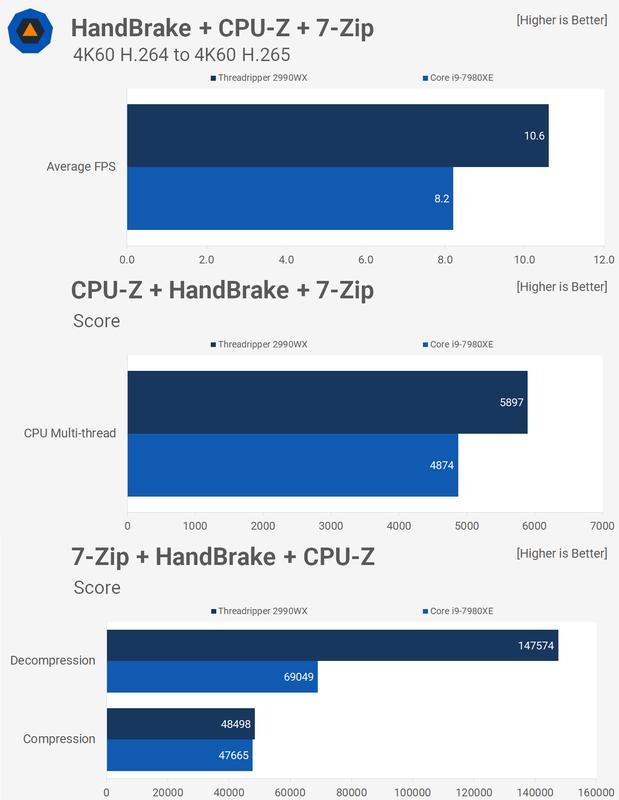 The 2990WX is 22% slower in HandBrake, 95% faster in CPUz and again we see the same mixed 7-zip performance that we discussed earlier. Running all three applications simultaneously does provide some interesting results. Whereas the 2990WX was 22% slower in HandBrake previously, it’s now 29% faster, so that’s impressive. It does take a big hit in CPUz but even so was still 21% faster than the 7980XE. Then even in 7-Zip, we find positive results for the 32-core processor. It managed to maintain a good chunk of its decompression performance and the 7980XE took a big enough hit in the compression test that the 2990WX was able to just edge ahead. 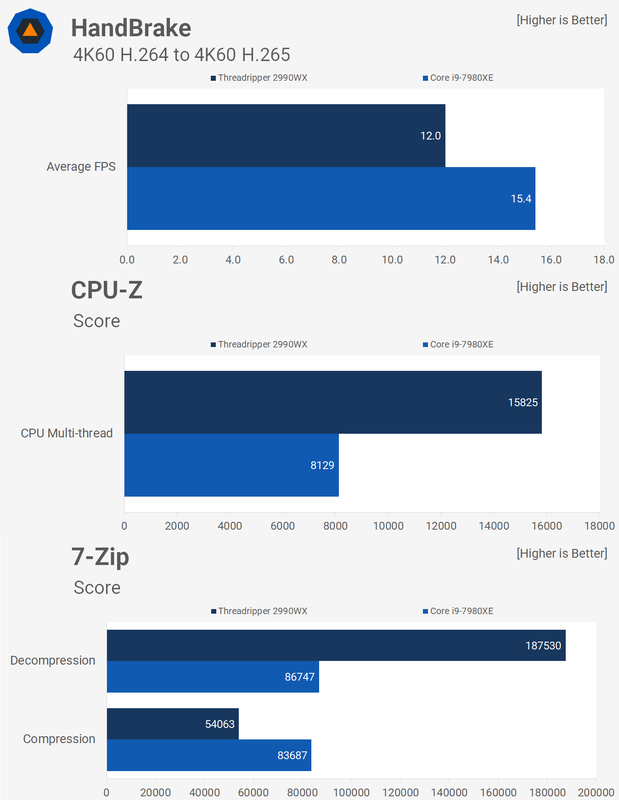 So this is the first truly great result that we’ve seen for the 2990WX in these multi-tasking benchmarks as we haven’t included a rendering workload to prop the 32-core processor up. Last up we have another tripleheader using POV-Ray, WinRAR and F1 2017. POV-Ray provided the 2990WX with its best result in our day one review and as you can see it’s 36% faster than the 7980XE in this test. 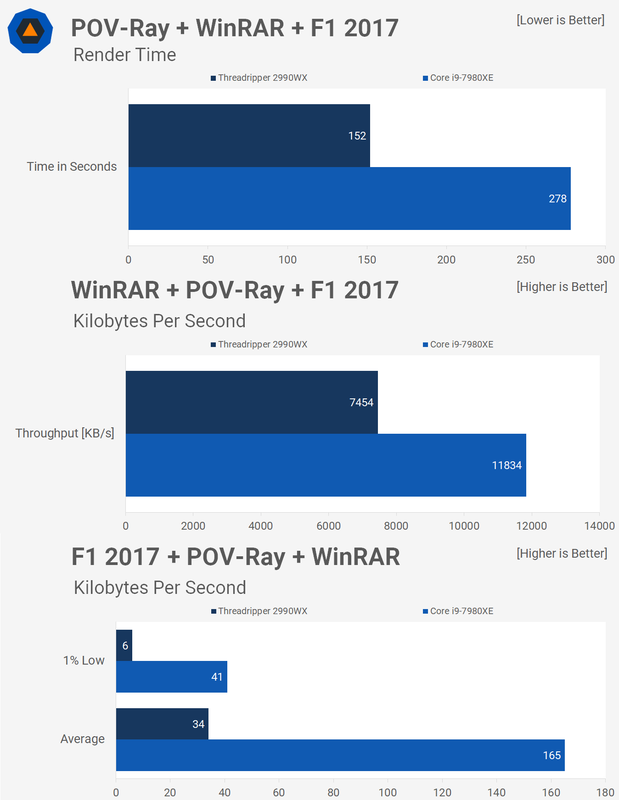 WinRAR though isn’t very core heavy but it is extremely memory intensive so it will be keen to see if that messes with the POV-Ray performance. The 2990WX was 59% slower than the 7980XE when testing with WinRAR, or another way of putting it, the 7980XE was 142% faster. Finally, we have F1 2017 and here the 2990WX was 24% slower when comparing the average frame rate and 30% slower for the 1% low result. As we’ve seen time and time again, when multitasking the 2990WX’s advantage in rendering applications is only extended. Where it was 36% faster than the 7980XE previously, it’s now 45% faster. 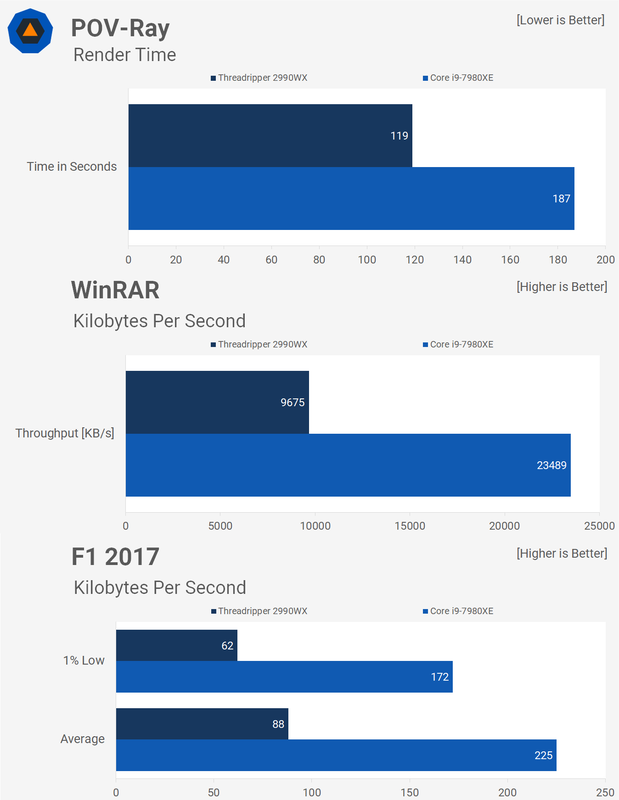 Meanwhile, it was 59% slower in WinRAR previously, now it’s just 37% slower. Still slower of course but a greatly reduced margin. However, things do go horribly wrong for the gaming performance and now F1 2017 is completely unplayable. Although the 7980XE did produce a 1% low result of 34 fps this is a little deceiving as the game was still very playable and only once or twice per lap did we notice a big lag spike. For the most part frame rates were up around 100 fps and it was a surprisingly good experience. The 2990WX, on the other hand, was a stuttery mess and would have been impossible to play, thankfully though the canned benchmark was taking care of the driving. So again we see a mixed performance from the 2990WX in this test. We’re now better armed with more information in regards to how the 2990WX performs than we were a few days ago. That said, this additional information hasn’t changed our perception much. Throwing more work at these CPUs just provided more mixed results, whereas you’d expect a 32-core processor to crush an 18-core processor under these conditions, it didn’t. The performance hiccups that we’ve seen with the 2990WX so far might not all be down to the NUMA configuration, increased memory latency for half the cores, or limited per core bandwidth when fully utilized. But there’s also the possibility that the culprit can be found on the Windows scheduler. It’s certainly possible a future Windows update could improve things for the 2990WX and we’ve already seen this with the first generation Threadripper CPUs. The bottom line remains untouched from yesterday’s review. We’d buy neither the 2990WX nor the 7980XE, instead, we would buy the 2950X. The 2990WX seems risky at the moment, the mixed Windows performance and the extreme price is sketchy enough, but we’re almost certain by this time next year AMD will have something significantly better on offer using the 7nm process. From a consumer standpoint, the 2990WX is poorly timed. From AMD’s perspective, we get why they released such a product. As always we’ll continue to benchmark and update you if any noteworthy changes are made.